Free airport service. Pick up your vehicle directly from the fourth floor of the Airport´s carpark without transfers or waiting. When making your booking you should choose the category of the car you want to hire, and we will provide you with one of the models in the category required and confirmed. In the event that there are no vehicles available in the category you have booked, VANRELL will provide you with a model that is similar or from a higher category at no extra cost. It is important to take into account that the images on our website are illustrative. 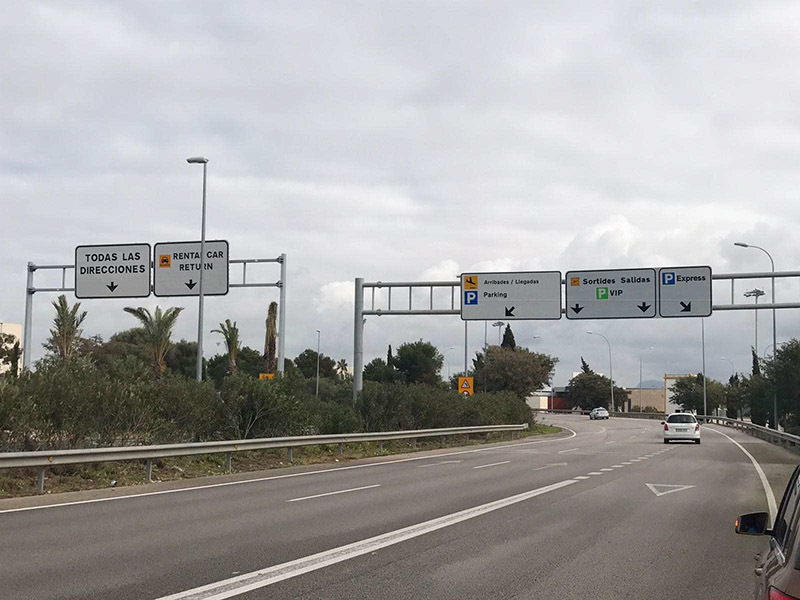 Under no circumstances may you take your rental vehicle off Mallorca or ship it using any type of maritime transport. You must present a valid driving license and identity document/passport when picking up your car. Privacy and data security guarantee. VANRELL respects the privacy of its customers and for this reason does not sell or disclose confidential information to third parties. Payments in cash are accepted, however, there are some exceptions. VANRELL does not require customers to pay a deposit or take out car hire excess insurance, except in the case of category Z vehicles. All prices include an all-risks insurance policy. However, this policy does not cover damage to windows, the windscreen, wheels (tyres and hubcaps) and/or wing mirrors. *In case of puncture, the customer must change the tire. If you require assistance, the mileage will be charged. Any category that is not specifically mentioned will be subject to the conditions of the group to which it belongs alphabetically. Damage to the vehicle or personal injury to third parties due to negligent driving, driving under the effect of alcohol or drugs, and/or dangerous driving. Damage caused by driving over roads in bad condition. Filling the car up with the wrong fuel. Damage to the car locks or interior of the vehicle. Damage to the underside of the car. Damage caused by incorrect clutch use. Damage, loss or theft of the vehicle´s accessories (such as the antenna, jack, windscreen wipers, petrol cap, boot tray, triangles, GPS, jackets, child car seats etc.) or of your personal belongings. VANRELL does not accept any responsibility for any possessions that you may leave behind in the vehicle. If you decide not to take out the optional VANRELL COMFORT insurance, you will not be entitled to a replacement rental vehicle in the event that the car you are driving becomes unusable due to an accident where you are at fault, nor will you be entitled to a refund. The customer will pay the costs of any damage which is not covered by the insurance policy and is due to irresponsible, dangerous and/or negligent driving. In order for the insurance cover to be valid customers must comply with all the conditions given in the car rental agreement. This includes the condition that in the event of an accident a customer must present the accident statement or police accident report within a maximum of 48 hours, starting from when the incident occurred. If a customer has taken out insurance with another insurance broker, this in no way implies that they are covered by VANRELL. Consequently, the customer is solely responsible for claiming reimbursement for damages from the insurance broker. Additional drivers (max. 2 additional drivers per rental agreement): 3 € / day / driver – Max. 60 €, except for vehicles in categories H, J and Z. Young drivers (<24 years old and/or driving license for <2 years): no extra charge. They may only rent a car in categories A, B, C and/or C1. Navigator / GPS: 4 € / day – Max. 60 €. Out of hours’ surcharges: there are no fees for picking up or returning a vehicle from between 8:00 and 21:59 at any time of the year. There will not be any refund in the case of returning the car before the stipulated time on the contract. We do not charge for petrol. Instead, we deliver your car to you with a set amount of petrol, and you should return it to us with the same level of fuel. If you are unable to fill up the tank and return the vehicle to us with less petrol than you started with, you should inform the company representative before leaving the airport, and pay the amount owing. In the event of mechanical breakdown or failure due to misfuelling, you are responsible for paying the costs of empting the tank, refuelling with the right petrol, repairing any mechanical breakdown or failure, and the return trip travel expenses, € 0.50 per kilometre, of our staff, if they are required. Fine management fee: € 24.90 for each fine. This does not include payment of the fines. Returning the vehicle to the wrong location (60 €), or abandoning it (120 €). We accept bookings 24/7, 365 days of the year. If you book between 10:00 p.m. and 6:00 a.m. you will need to give us a valid telephone number so that we can confirm the booking, and pay in advance with a credit card. Winter office hours (from November to March): 8:00 – 19:00. Summer office hours (from April to October): 9.00 – 22.00. Our agents will be waiting for you in the designated area (check-in), next to the lifts, on the fourth floor of the airport carpark. You can pay the airport parking fee at the automatic pay machines in the carpark, either in cash or by credit card. 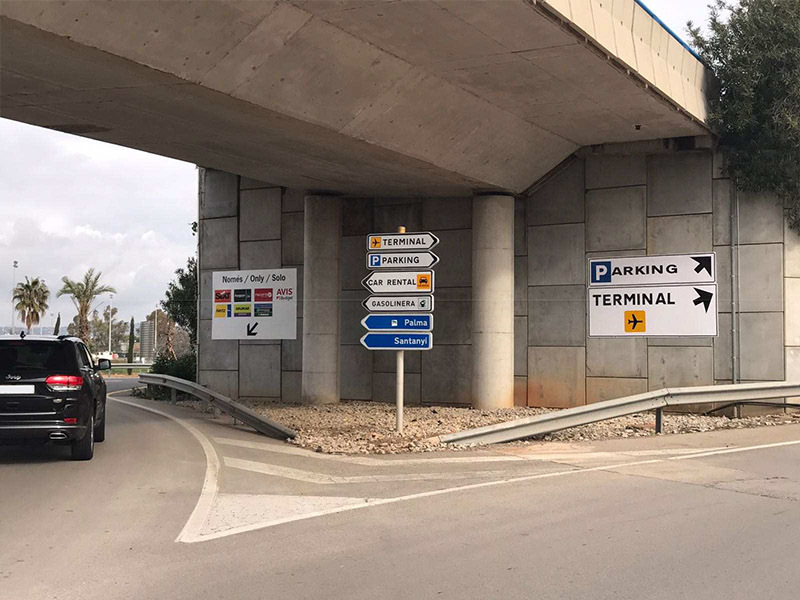 The maximum amount you will have to pay for the airport parking is 10 euros. 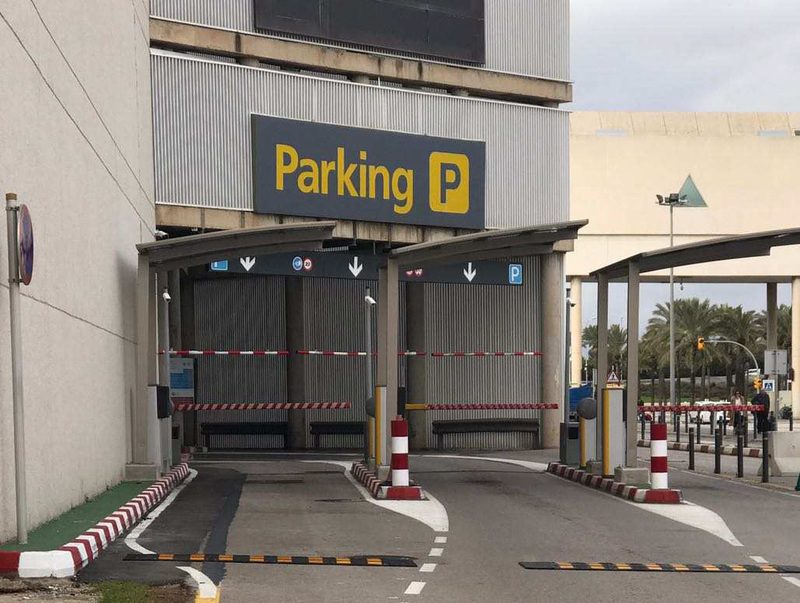 Please, return the car to the 3rd floor of the airport carpark, in sector G – H, which is usually the same place where you picked it up from at the start of the rental period. Leave the keys and the ticket in the car boot and close it. Please do not worry about this, as our agents will take the car in a short period of time. Make sure you do not leave any of your personal belongings in the car. VANRELL accepts no responsibility for any possessions you may leave behind. 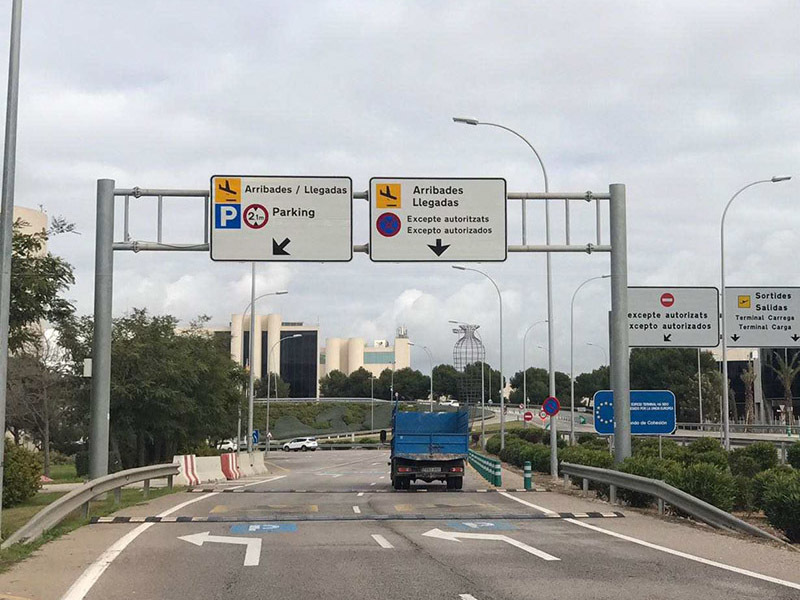 In order to reach the parking area assigned to VANRELL on the third floor of the airport carpark, you should follow the signs for TERMINAL / LLEGADAS and not those for CAR RENTAL RETURNS. You must return the car to the office where you made the booking. If you want to return the car to a different location on the island, you should consult with our staff beforehand, and pay any applicable transfer fees. If you cancel your booking by sending an email to vanrell@rentacarvanrell.com at least 48 hours before the pickup time given in the booking, you will not have to pay any cancellation charges. If you cancel less than 24 hours before the pickup time you will have to pay a cancellation charge of 30 €. If you have not picked up your vehicle during the 3 hours following the pickup time given in the booking, the rental company will consider the booking to be a no-show and will be entitled to rent the vehicle out again. Cancellations that are received less than 2 hours before the pickup time will also be considered to be no-shows. No-shows and customers who cancel less than 2 hours before the pickup time have to pay the full booking price in order to cover the company´s operating costs and loss of earnings. The cancellations with prior notice lower than 15 days will entitle the payment of the 50% of the booking. The cancellations received in a period of time lower than 24 hours will entitle the payment of the 100% of the booking. If you have not picked up your vehicle during the 3 hours following the pickup time given in the booking, the rental company will consider the booking to be a no-show and will be entitled to rent the vehicle out again. No-shows and customers who cancel less than 24 hours before the pickup time have to pay the full booking price in order to cover the company´s operating costs and loss of earnings. Rental car bookings may be extended, subject to availability and price confirmation by the company. In this case you must sign a new contract at the company´s offices, and pay the price set.